It seems as though spring has begun—the sun is shining and it’s finally warm outside. One of the drinks that you can cool off with is bubble tea. Bubble tea comes in a lot of refreshing flavours with pearls and jelly that you can chew on. 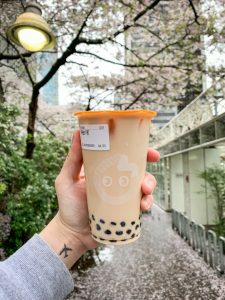 In the past decade, more new bubble tea places have opened up all across the Lower Mainland, and existing chains have opened more locations as well. The drinks themselves are evolving too. There are more ways to drink bubble tea than ever before! You can now drink a variety of teas hot or cold, and newer places give you the option to make your drink however you like it by deciding how much sugar and ice is in the tea. Recently, a new branch of the bubble tea chain Chatime opened near the New Westminster Douglas College campus, just a few blocks away from Bubble World. With so many bubble tea places in the Lower Mainland one has to ask, which one has the best bubble tea? I decided to go to a few places near the campuses to compare how they are prepared. Out of the five bubble tea places that I went to, two of them are international chains that have locations around the world. In all of them I ordered green milk tea with pearls, and in the places where you can customize your tea, I added 50 percent sugar and regular ice. First, we have Bubble World, where I also put green tea jelly in my drink to add more green tea flavours. It had a creamy, milky taste as well as the green tea taste, while the pearls and the jelly were very chewy. After that I went to TeaLab, which is near the Coquitlam campus and looks much like a Starbucks with its signs. My drink had a roasted tea taste and the pearls were fresh, warm, and soft. Back in New Westminster, bubble tea in Chatime is made with special equipment, which seems fitting for an international chain. Right now for students, you can get a large drink for the cost of a small one. I ordered a Matcha Tea Latte with green tea on top and while it tasted great and the pearls were delicious, the flavour did not cause my mouth to explode. Next, I went to CoCo, which is near Lougheed Town Centre Station. There is a sign in the front of the place that claims they are the world’s favourite bubble tea brand. Grand as that claim is, I will say that their large-sized cups are the tallest bubble tea cups I’ve ever seen. The milk in my tea was very milky and refreshing, and there were also a lot of pearls in my drink that made it more delicious. Finally, I went to Pearl Fever. Their bubble tea had the right ratio of green tea to milk, while the pearls had a maple taste and were chewy and delicious. After comparing all the bubble tea stores I visited, I’d say Pearl Fever is the best because the drink I had there had a yummy blend of green tea and milk taste at the same time. As for pearls, Tea Lab has the best pearls—they tasted like I was eating a freshly baked cookie. Out of the two international bubble tea chains that I went to (CoCo and Chatime), CoCo had the best offering because their generous portion of pearls made the drink more delicious. Bubble tea is a cool, soft, and innovative drink that is always changing to keep up with the creative imaginations of its consumers and fans.